Bringing new meaning to the phrase 'happy couple,' Chinese businessman Wu Duanbiao gave his daughter and her husband a dowry worth nearly $150 million in celebration of their wedding on Sunday, according to the South China Morning Post. Wu, who is the chairman of the ceramics firm Fujian Wanli Group, gave his daughter and her new husband four boxes of gold jewelry, millions of dollars deposited into their bank account, donations to local charities in their names, shares in the ceramics firm, two cars, and "an impressive property portfolio." 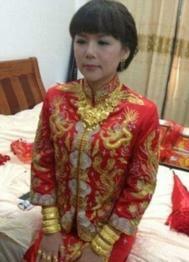 A spokesman for Wu's firm confirmed the dowry. The groom's finances have vastly improved since his marriage on Sunday. He only makes about $24,000 a year, and "gets his bread from the government," according to the Daily Mail. The bride and groom have known each other since they were in kindergarten. 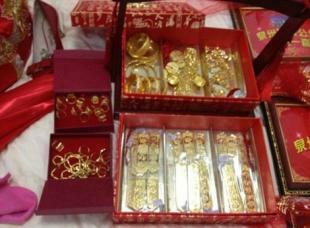 Reports of the Wu dowry and photographs of the bounty were published by the South China Morning Post on Monday. The story follows a report by Chinese newspaper the Apple Daily claiming that marrying a daughter from this province in China is "
better than robbing a bank." The dowry practice isn't uncommon in China, especially in the Fujian province. The tradition is believed to ensure that the bride will be treated well by her husband and in-laws. Just last month, two other billionaires gave their daughter and niece dowries totaling in the millions. On a community board for International China Dating Services, several people had questions over how much dowry they would be expected to pay for a Chinese wedding, or if the dowry tradition was a necessity. One commenter from Copenhagen wrote, "Dowry is a tradition and Chinese culture. When you refuse to pay, then they do not believe you love their daughter enough. I know it is not true, but I have to recommend you: Just pay and live happily with your girlfriend/wife." The popularity of the dowry payment amongst elites in the Fujian region is in contrast to the rest of the country, where eligible women are becoming a rarity, due to China's laws about single births and the preference for male over female babies. 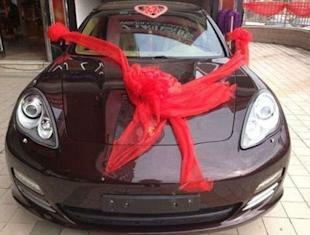 In fact, most single men in China pay fees upwards of $30,000 to find a bride, according to a report from The Hindu. The closest comparison to the dowry tradition in the United States is the expectation that the bride's family will pay for the wedding, but like all traditions, that one is changing with the times. According to Psych Central, only 17 percent of couples have their parents foot the bill, with most choosing to share the financial burden with their family. How to buy a wedding giftBuying a couple a wedding gift has never been easier thanks to online registries and wedding websites. So why is it still so complicated? Here with gift etiquette advice is Carley Roney of The Knot.